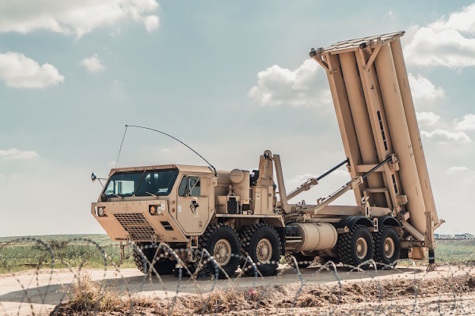 Yesterday (Sunday), the European Command of the United States Army (EUCOM) completed its first ever rapid deployment of the THAAD (Terminal High Altitude Area Defense) missile defense system in Israel, after the system arrived in early March. The deployment was a part of the close cooperation between the IAF and the United States Military, exemplified in exercises and routine joint operational activity, whether through overseas communication or actual training. The American battery - reminiscent in its capabilities of the "Arrow 2" weapon system - is an anti-ballistic missile defense system designed for high-altitude interception. "The first deployment of a THAAD battery in Israel is a historic moment. The deployment is great for both countries, and it signifies the United States' commitment to Israel", emphasized Col. David E. Shank, one of the deployment commanders. "The deployment makes us more prepared for real-time situations when US forces deploy in Israel during combat", elaborated Brig. Gen. Ran Kochav, Commander of the IAF Air Defense Array. "In today's reality, wartime will move at a rapid pace. This is why we're practicing transporting the weapon systems to the operational sites in the shortest timespan possible", added Col. Tamir Zimber, Commander of the Air Defense Array's Preparation Branch. Unlike previous joint exercises held in cooperation with the US, this deployment saw the operational system arriving at Israel. "This deployment put our operational capabilities to the test. As a result, we stuck to the operations order", said Col. Zimber. "Part of the idea behind deploying the forces was doing it without notice in order to focus on rapidity". The American deployment provides Israel with additional options for defending its skies. "The contribution goes both ways. We earn the United States' capabilities, and the US earns a foothold in the Middle East", added Col. Zimber. An additional advantage the deployment provides is the ability to test the American system and the way it participates in emergency training. The American weapon system will operate in synchronization with the Israeli systems deployed across Israel, joining the IAF's air defense capabilities in operating against long-range ballistic missiles. "We have a mutual operation network. Everybody works according to one Israeli-American protocol and we all share an aerial overview", explained Brig. Gen. Kochav. Col. Zimber added: "This exercise allows us to see if the synchronized systems operate properly". However, it is important to note that the Israeli forces are in control of the interceptions. "Our state is sovereign and so we are responsible for protecting its skies – the Americans provide us with a helping hand", emphasized Brig. Gen. Kochav. "The THAAD battery provides us with additional capabilities in interception. The decision regarding which weapon system should be utilized is made according to the threat at hand – an additional weapon system expands our scope". "We develop multi-layer defense systems for defense of Israel's skies, including 'Arrow 2', 'Arrow 3', 'David's Sling' and 'Iron Dome'. The American system being added to our toolbox allows for a more flexible response to potential threats", explained Col. Zimber. Col. Shank added: "The THAAD provides the ability to intercept ballistic missiles at medium range". The "Juniper Falcon" 2019 joint directorate exercise was held recently as well. As part of the exercise, combatants from the Air Defense Array met with EUCOM forces and drilled the arrival of United States combatants to Israel at times of operational need. The short span of time between the two exercises allowed for an ideal streak – during "Juniper Falcon", the forces drilled the arrival of the American directorate to Israel as well as every stage preceding the arrival of the operating forces; the THAAD deployment then simulated the forces' actual arrival. "We have a long history of joint exercises", said Col. Shank. "The discussion regarding the THAAD exercise in Israel has been going on for a while. Seeing it go from planning to praxis indicates how strong the two countries' partnership is". "There's no partner stronger in the Middle East than our Israeli partners", concluded Col. Shank. "I think it's a good opportunity for our soldiers to work shoulder to shoulder with the IDF and the IAF's Air Defense Array. It's a unique opportunity – not just professionally, but personally as well".